The Early Byzantine basilica which was discovered recently in the city of Veliko Tarnovo in Northern Bulgaria may prove the key to the exploration of what was an unknown but major Byzantine city, and to answering the question why Veliko Tarnovo, then known as Tarnovgrad, was made the capital of the Second Bulgarian Empire (1185-1396 AD). This hypothesis has been presented by Prof. Hitko Vachev from the Veliko Tarnovo Regional Museum of History who discovered the Early Byzantine basilica southeast of the fortress wall of the Tsarevets Hill Fortress, in the so called Frenkhisar, or the “Frankish Quarter", of the medieval Tarnovgrad. Speaking at a news conference in Sofia, Vachev has pointed out that the 6th century Byzantine basilica that he found was impressive in size meaning that most probably it was the seat of a bishop, a completely unknown fact until now, reports BTA. In a nutshell, the archaeologist’s hypothesis is that the presence of a bishopric in the Early Byzantine period in what later became the medieval Bulgarian city of Tarnovgrad (Veliko Tarnovo), with its two citadels, the Tsarevets Hill Fortress and the Trapesitsa Hill Fortress, means that in the Late Antiquity and Early Middle Ages, the Tsarevets Hill was the site of “one of the most fortified Byzantine cities". 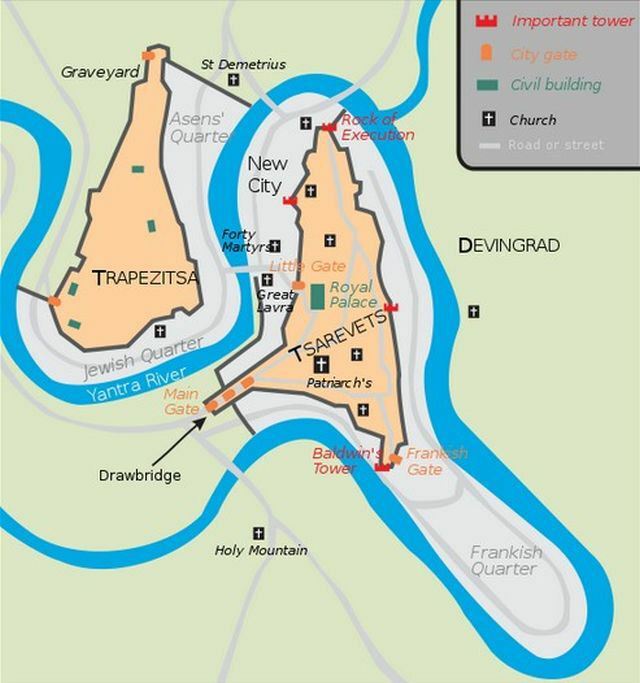 The existence of such an Early Byzantine city on Tsarevets would explain why Tarnovgrad was picked as the capital of the Second Bulgarian Empire enabling it to emerge as a power center rivaling Constantinople for much of the High and Late Middle Ages, the reasoning goes. While the period of the Second Bulgarian Empire, the 12th-14th century AD, has been more thoroughly researched in the archaeological sites in Veliko Tarnovo, this has not been the case with the period of the Late Antiquity and the Early Middle Ages. This is the reason Bulgaria’s archaeologists keep making notable discoveries there such as Vachev’s 2014 discovery of an unknown monastery, and the recent discoveries in the Trapesitsa Hill Fortress, and in the nearby fortress Rahovets where Tarnovgrad’s garrison was stationed in the 13th-14th century AD. 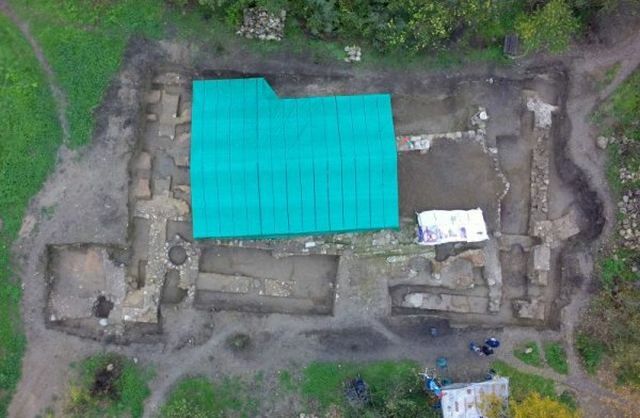 The Early Byzantine basilica, which has given Vachev grounds for his new hypothesis that before Tarnovgrad became the capital of the Second Bulgarian Empire it was the site of a bishopric and a major heavily fortified Byzantine city, has been found during the continuing excavations of the ruins of the Bulgarian monastery from the 13th century that the archaeologist found in 2014. Upon excavating further the ruins of the Early Byzantine temple, the archaeologist and his team have found that it was 40 meters long and 20 meters wide. The imposing size, among its other features, indicates the importance of the church and the possibility that it may have been the seat of a bishop. It was on top of these Early Byzantine ruins that the church of what was the Monastery of the Mother of God (Virgin Mary) was built in the 13th century AD by the Bulgarians. “If the hypothesis [that the basilica was a bishop’s temple] is proven, and the further excavations show that one of the most fortified Byzantine cities was built on top of Tsarevets as a the center of a bishopric, this will provide clarity as to why of all cities [Veliko] Tarnovo was chosen to be the capital of the Second Bulgarian Empire," Vachev explains. The choice of Tarnovgrad as the Bulgarian capital after Bulgaria was liberated from Byzantium in 1185 AD has been thought to have to do with the fact that the first Tsars of the Second Bulgarian Empire, the boyars Asen and Teodor (Petar), were natives of the region located in today’s Central Northern Bulgaria. The capitals of the First Bulgarian Empire (632/680 – 1018 AD) had been Pliska (680-893 AD) and Veliki Preslav (893-970 AD) in today’s Northeast Bulgaria, and Ohrid (from the end of the 10th century until 1018 AD) in today’s Republic of Macedonia. “Last year, when we started the excavations we knew that Tarnovgrad had three monasteries dedicated to the Holy Mother of God. We didn’t know where they were located. The Virgin Mary was the patron of the city, and the cult for her was very strong there. We have found the church of this monastery complex, and we have enough data to suggest that this probably is the Dormition of the Mother of God Monastery mentioned by Grigoriy (Gregory) Tsamblak (ca. 1365-1420, Bulgarian cleric and metropolitan of Kiev – editor’s note)," explains the archaeologist. He reminds that upon the discovery of the monastery in 2014 his team also found graves of medieval Bulgarian aristocrats and clerics, and a brick tomb of a noble woman. Under the head of one of the buried men, the archaeologists found a brick with engraved verses 1-4 from the Gospel of John, which is the first time such a discovery has been made in Bulgaria. The 2015 excavations were started by Vachev’s team with the goal of studying further the necropolis and the buildings of the 13th century monastery they found in 2014. “[However,] we came across artifacts suggesting that we may unearth [structures from] earlier periods. To my great satisfaction, we have revealed partly this Early Byzantine basilica. 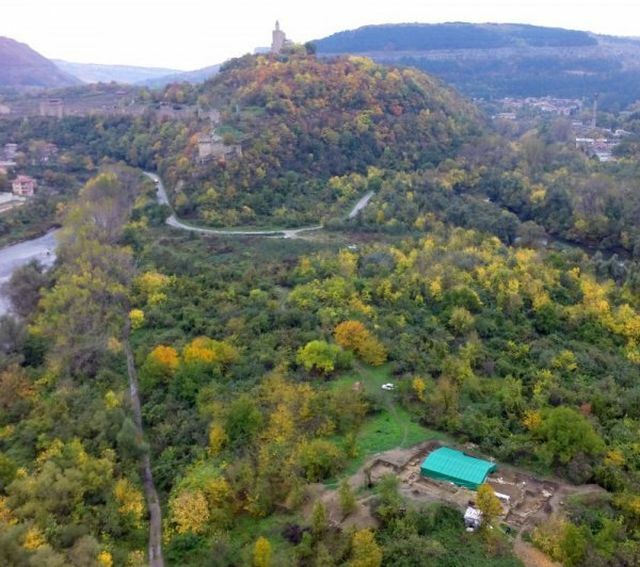 Its size is 40 meters by 20 meters, and there is no doubt that this was an extremely important building changing our perceptions about Veliko Tarnovo and the inheriting of the religious sites," Vachev states. He elaborates that in the Early Byzantine period the Tsarevets Hill towering above the site where the basilica is situated apparently grew into one of the largest fortified cities in provinces of Byzantium, i.e. the Eastern Roman Empire, a successor of the glorious Ancient Roman city of Nicopolis ad Istrum whose ruins are located to the north of Veliko Tarnovo. “In the 5th-7th century, a settlement emerged on the Tsarevets Hill which grew into a fortified city, a successor of the Roman and Early Byzantine city Nicopolis ad Istrum which was also a bishopric center. We know the names of two bishops of Nicopolis ad Istrum. After a number of [barbarian] invasions, and the waning of Nicopolis ad Istrum, the bishopric moved to Tsarevets, and this is where one of the largest cities in the northern provinces of Byzantium developed," Vachev says. “The discovery of this basilica raises some issues, and allows us to resolve some questions with respect to the development of the city which beyond doubt had a huge area. The fact that in Early Byzantine Era Veliko Tarnovo developed on such an impressive territory, I think, gives us an answer as to why at the end of the 12th century precisely this city was picked as the capital of the restored Bulgarian state," explains the archaeologist. In addition to the new hypothesis about the life in Tarnovgrad in the Early Byzantine period and the choice of the capital of the Second Bulgarian Empire, the latest excavations by Vachev’s team in the Frenkhisar quarter of the medieval city provided evidence that the site was inhabited from the 6th until the 18th century AD. 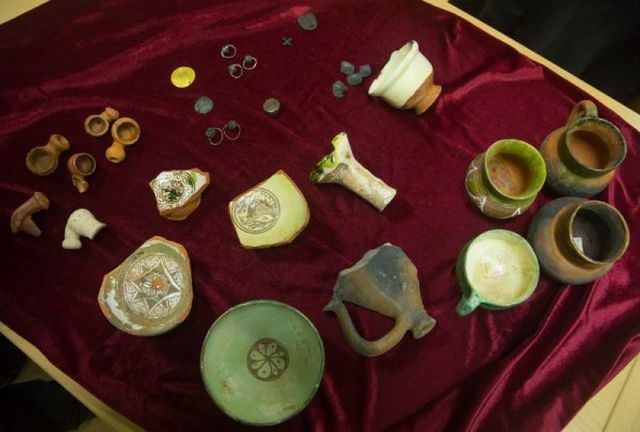 “The artifacts, which have already been restored by Mihaela Romanova and Iliyan Petrakiev, date from the 6th until the 18th century, and trace the life of the settlement in this part of the city," Vachev says. The archaeologist hopes that his discovery will provide reasons for a much wider research effort into the respective part of the medieval city of Tarnovgrad. He and his team are convinced that the site the working on is a holy place which is why they set up there a small chapel in the name of the Mother of God funding it on their own. “In any case, this is a very holy place, and 7 centuries after the creation of the monastery this holiness needs to be underscored. This is also the way to promote a site that is yet to be developed," Vachev concludes. The medieval Mother of God Monastery in Veliko Tarnovo was one of the major archaeological discoveries in Bulgaria in 2014. Its ruins are located to the southeast of the fortress wall of the Tsarevets Hill Fortress, in the so called Frenkhisar, or “Frankish Quarter", of the capital of the Second Bulgarian Empire Tarnovgrad.